Who loves Snack Pack puddings? We do! Always affordable and great for the whole family to enjoy. Now comes some magic to grocery store shelves with Snack Pack's New Unicorn Magic Pudding Cups. Little girls especially in the family are going to LOVE these.. they are so pretty in pastel pink and baby blue, come with a couple of sweet tattoos inside the package, and taste "yummy!" No little kids here, BUT even these 2 adults loved them! Perfect for dessert or snacks. Made with real milk! Snack Pack's New Unicorn Magic Pudding Cups are available at most grocery stores for a suggested retail price of $2.79. 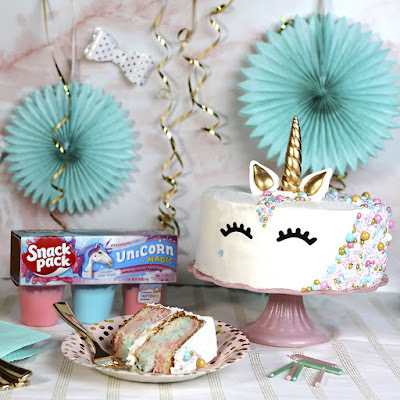 For more fun to share with your kids, visit www.snackpack.com/unicorn for tasty recipes and delightful Unicorn games. Snack Pack's New Unicorn Magic Pudding Cups- give them a try today!